Academic excellence is a key component of the McKendree University mission statement. The University provides high quality academic programs that are distinctive in content, academic rigor, course delivery format, and quality of instruction. 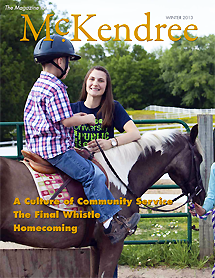 McKendree University faculty will create curricula and learning experiences that require students to take an active role in their own learning; to think critically about the world in which they live; to integrate knowledge and skills across disciplines; and to apply what they learn in authentic environments. Students will graduate from McKendree University with a solid foundation in the liberal arts, expertise in their chosen field of study and the skills and passion to fulfill their responsibilities as global citizens. McKendree University believes that a college education should not be the final culmination of an individual’s educational pursuits but rather a springboard to lifelong learning. As a result, we seek not only to provide an excellent academic experience but also to offer a wide variety of intellectual opportunities beyond the classroom. This commitment allows our students, faculty and staff to come together as a community of scholars through lectures, theatre, film, art, music, literature and current topics to exchange ideas, express differing points of view, or simply enjoy a work of art or a great performance. Our goal in creating this environment is to enrich the life of our campus and local community, and to inspire in our students the desire to continue to engage in intellectually stimulating activities beyond their formal academic experience. McKendree University provides a unique learning environment large enough to offer students a variety of quality academic options yet small enough to personalize opportunities for individual development, allowing students to make their mark in a broad variety of ways. McKendree values engagement by all students and recognizes that the “McKendree Experience” is different for each student. Hallmarks of the “McKendree Experience” include an extraordinary education, faculty and staff collaboration with students, a strong sense of values and community, experiential learning, civic engagement, and an atmosphere of inquiry and mutual respect. McKendree University prides itself in the professional quality of its faculty and staff and their sense of satisfaction as employees, as evidenced by repeated recognition as “A Great College to Work For.” We recognize that opportunities for scholarship and development result in engaged employees that better serve our students and the University. To this end, McKendree University is dedicated to continuing its current initiatives and expanding avenues for professional growth and development for all faculty and staff. A tradition of academic excellence with the right combination of challenge and support is a cornerstone of the McKendree University experience. We have been doing excellent work, producing outstanding graduates, and making important contributions to our community for nearly two centuries. However, McKendree University is in the midst of significant transformation. We have experienced tremendous growth in academic and co-curricular activities, and in our graduate programs and online offerings. This growth, coupled with so many challenges in our environment from competitors, the economy, and state and federal regulators, requires us to seek new and innovative methods to share our McKendree story. Faculty, students, staff, parents, board members, and alumni all need to participate in the responsibility of sharing McKendree’s success story. We have a lot to be proud of and a lot to share. McKendree University will provide an environment that is conducive to student success. McKendree University recognizes that a well-maintained, aesthetically attractive, and secure learning environment is essential to the educational process. To secure our future, McKendree University will remain financially sound by strategically growing the student body, retaining the students enrolled, developing new programs for degree opportunities, and managing our endowment and resources strategically. Securing our future is divided into three major areas: human resources, finance and fundraising, and facilities.